Today we had a gert lush, Grand Day Out, in Brizzle. Sunshine, smiles and lots of Gromits. Kiddy Wink and Wonk searched excitedly for the next dog, trying to guess what colour it would be. We discovered parts of the city, we’ve not visited before. And, It’s great practice for queueing too, as they waited patiently for each photo opportunity! 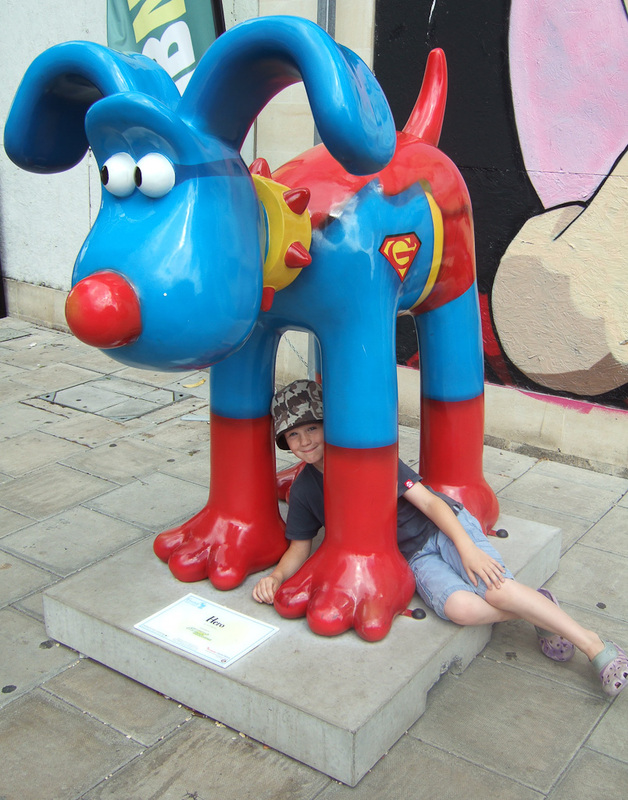 It’s a popular pastime in the South West at the moment and it’s great to see the full size Gromits in person. 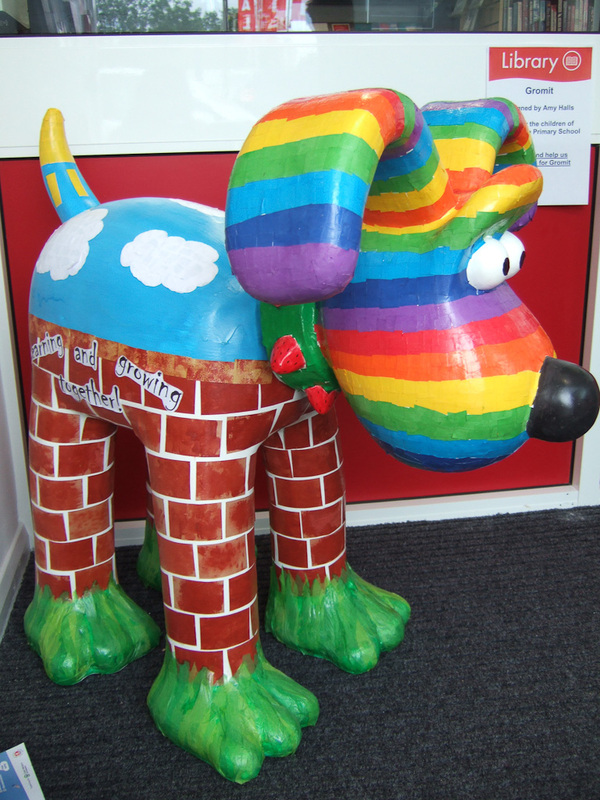 As an art voluteer at the Kid’s village primary school, I was lucky enough to help the pupils decorate their own smaller Gromit. All of the children submitted a design for the Dog and a winner was chosen. 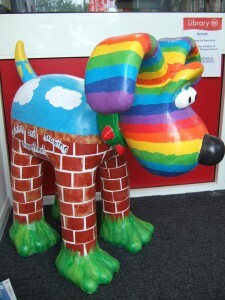 Led by a teacher, every child in the school was able to create a small part of Gromits transformation. They all worked really hard and he looked fantastic when finished. It was great to be a part of and all of the children were proud of their contribution. We made a fair dent in The Gromit Trail today. On the journey home the kids were busy planning their next trip, that is before they fell asleep. A favourite?…. that would be impossible, they are all so brilliant! This entry was posted in Days out on August 2, 2013 by admin. Ok, here goes………my first tutorial! 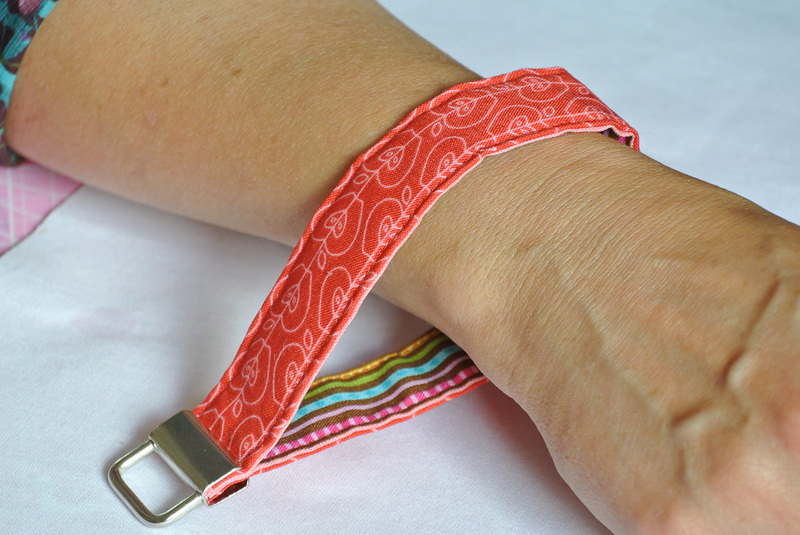 This is how I make, my version, of the ever useful Fabric Key Fob Wristlet. 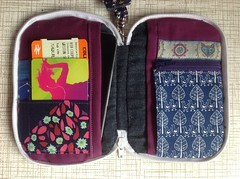 When selecting your fabric, you will need to choose one fabric for the outside and another, less visible, for the inside of the Wristlet. 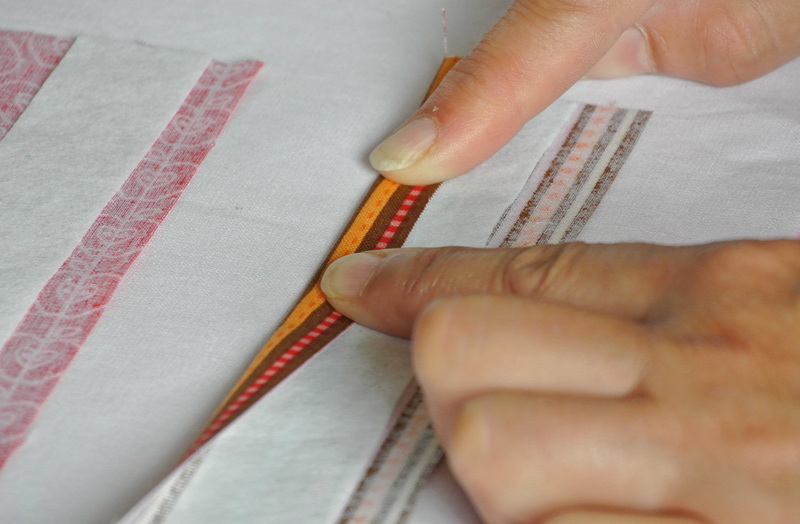 When cutting the fabric for the outside make sure you centre the pattern along the middle of the strip (along the 1″ mark). I found an 11″ strip of fabric was a good size for my hand. You can check this measurement yourself with a piece of string and adjust the size as necessary. 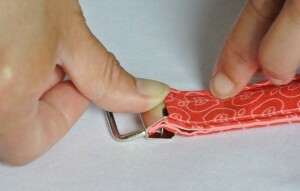 About 1/2″ of the length, of the strap, will be lost in the Key Fob Hardware in the final stages. 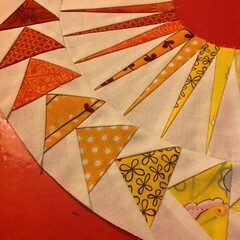 Lay fabric right side down and place interfacing on top along the centre. 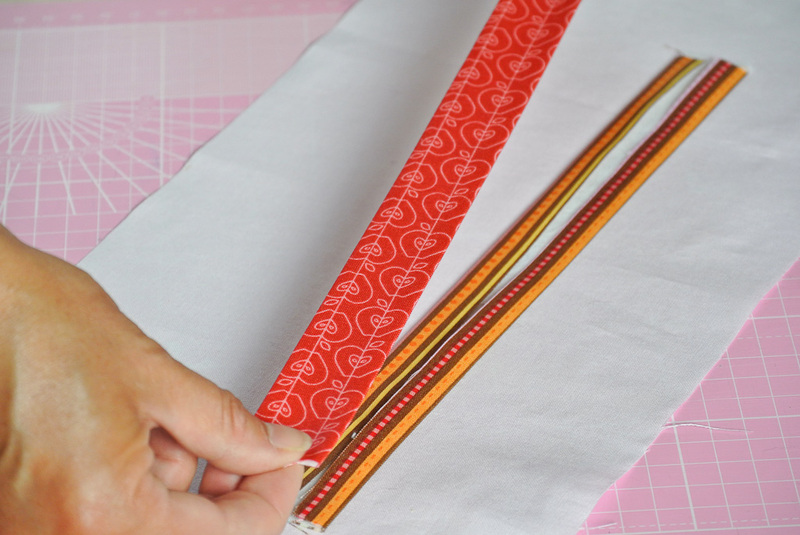 Turn your fabric strips face down on the table and position the 1″ interfacing strips along the centre. Feel free to pin if you wish, personally I don’t use pins….ever! I used firm sew in interfacing as this is what I had to hand. 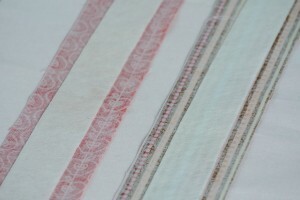 However iron in interfacing maybe easier as it won’t wriggle around! Fold fabric over the interfacing, towards the centre. Fold fabric over the interfacing, towards the centre and iron. Only apply heat to the fabric, not the interfacing. 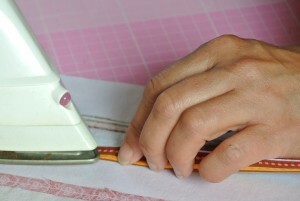 If you are using sew in interfacing like me you will need to make sure this doesn’t move as you iron. 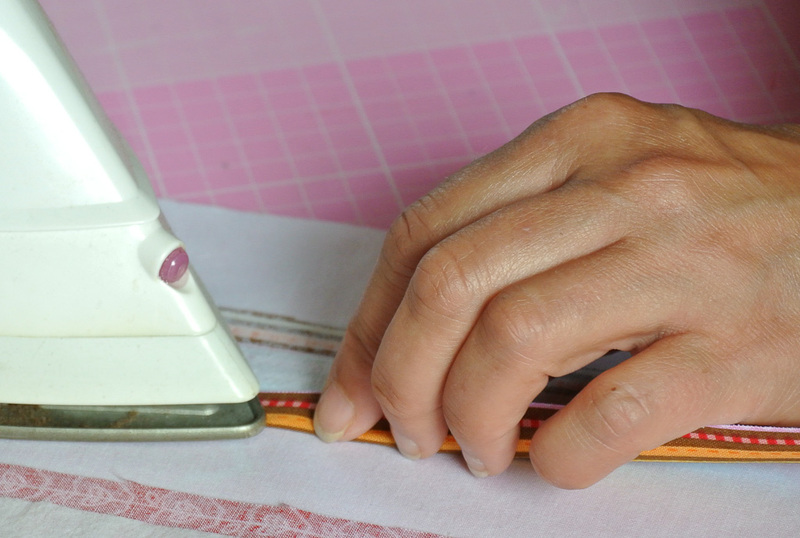 Once you get the hang of it is possible to fold (fabric) and hold (interfacing) as you iron! Fold over and iron the fabric along all 4 lengths of your Key Fob Wristlet. Careful not to burn your fingers or interfacing neither will like it much! Turn over your fabric strips and iron on the right side too. This will make the next steps easier. 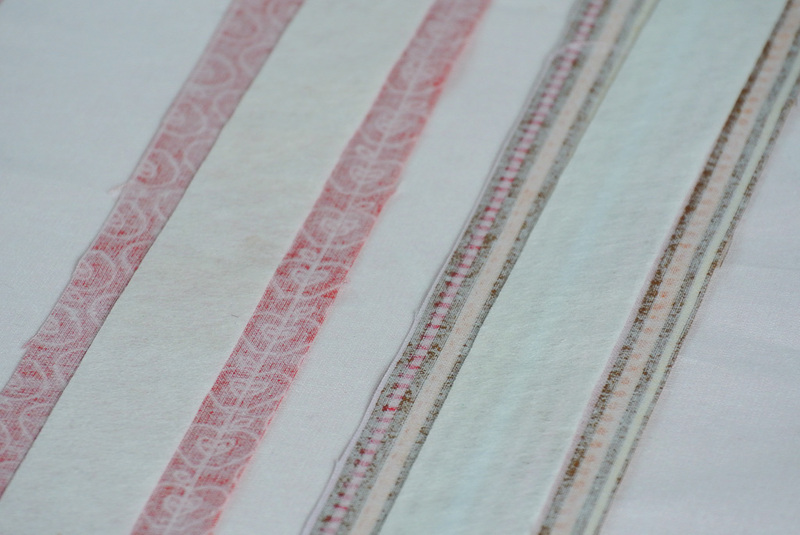 Lay one fabric interfaced strip on top of the other. 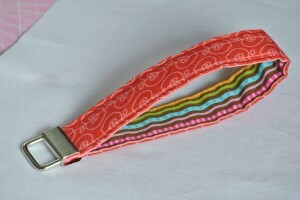 Take one of your fabric interface strips and place it on top of the other, wrong sides together. 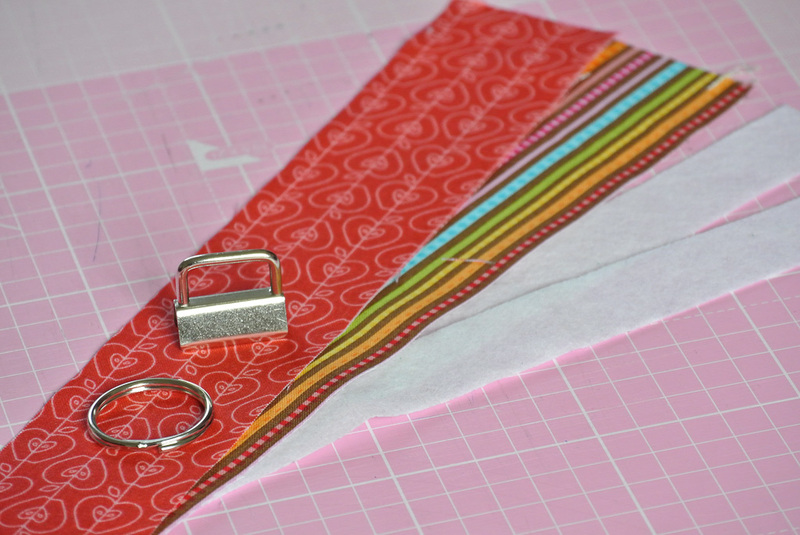 Once you have two short ends lined up (pin if you wish), you can start sewing. Topstitch along one length of the fabric strip sandwich. I set my stitch legth to 3. You need to sew close to the edge, but not so close that you fall off the edge. Both pieces of fabric need to be sewn together. Turn at the end and zigzag (1) across the width, with a shorter stitch length (1.5). Repeat along the other length and width. 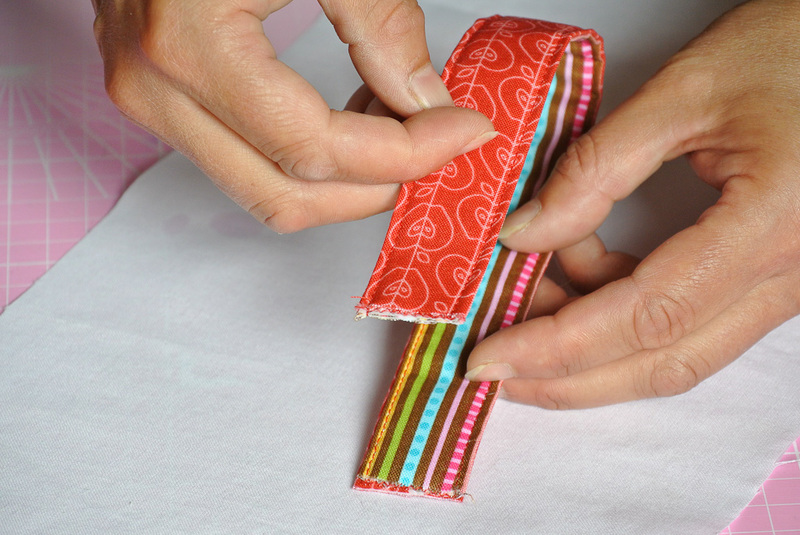 When you have sewn the two fabric strips together, trim the ends to neaten. Align both short ends, one on top of the other. Make sure your chosen fabric is on the outside. Push the ends gently into the Key Fob Hardware. When you are happy that your strap is central in the Hardware, hold fabric in place with your left hand and press the clasp shut with the thumb of your right hand. 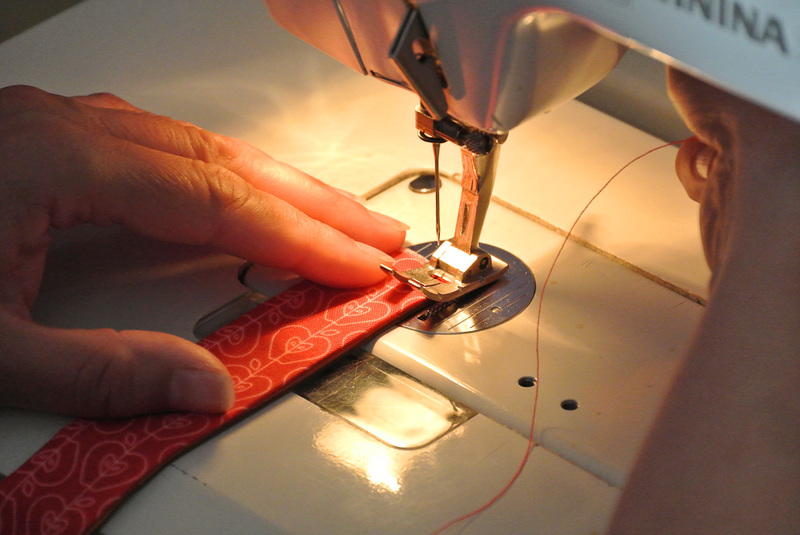 The prongs will hold the fabric gently in place while you wack it tightly shut with a rubber mallet. 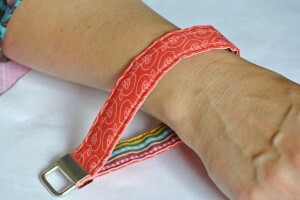 Wrap the wristlet in a towel first to prevent damage to all your lovely hard work. Stand back and admire your very own Key Fob Wristlet! 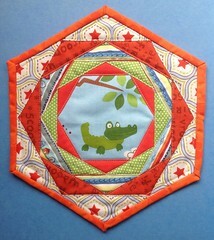 Thanks to Bubba and Bubba Wacki for entertaining Kiddy Wink and Wonk while I worked on this. ‘Yes’ it did take all day and ‘No’ I didn’t get to sew or have a cup of tea! Maybe tomorrow…………. 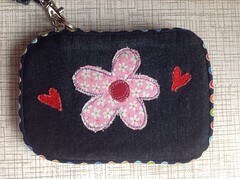 This entry was posted in Free Tutorial and tagged fabric, fob, free, hardware, key, tutorial, wristlet on July 30, 2013 by admin. 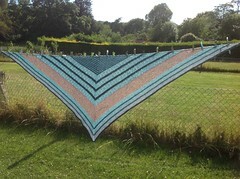 With the Scrappy Trip along and Schoenrock Cross QAL completed, there has been a void. Don’t get me wrong, I have lots of other exciting projects on the go. 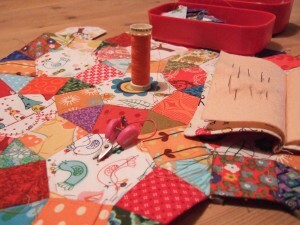 But I was suprised at how much I enjoyed taking part in a Quilt a Long. Trying something new, with a community of people, sharing and learning along the way. 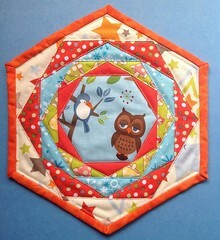 So, this week I have been looking for another project in the online quilting community. There are many interesting projects happening out there. 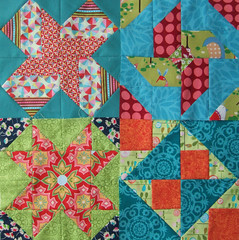 I have never taken part in a quilting bee before and I love Amy’s idea at Diary of a Quilter. 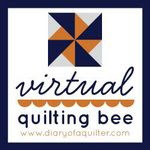 A virtual Quilting Bee, I can take part when I like at my own pace, perfect for a Bee beginner! 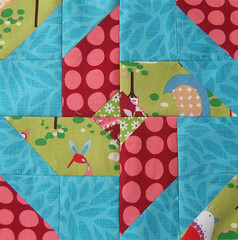 There will be a new block tutorial every other week, by 16 different bloggers. After 8 months you will have enough blocks to make a quilt. 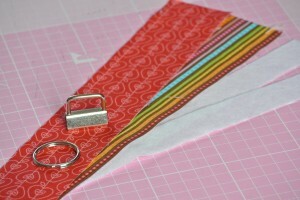 Amy has also written informative posts about supplies, quilting basics, and choosing fabrics/colors to get you started. 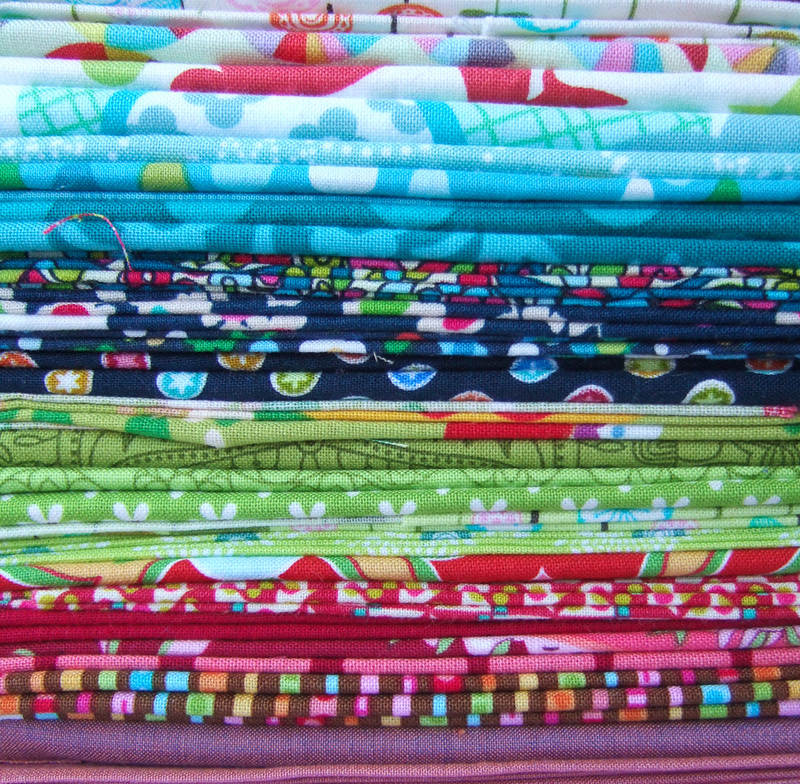 Firstly I picked my fabrics. I decided to use the stash I already have. 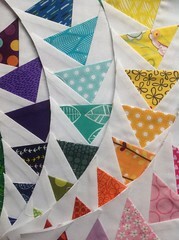 Usually I would select fabrics with a finished quilt pattern in mind. This felt a bit back to front selecting colours, without a plan in my head, of how they would ultimately fit together. Seeking guidance I read Amy’s choosing fabric and then followed her link to a ‘phenominal’ post The Art of choosing written by Jeni. I think I will be refering back to this for ever! 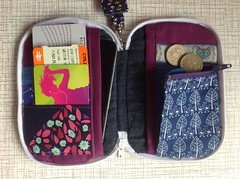 I had such fun doing this; found lots of forgotten about fabrics, swapped, changed and learnt a lot! I am sure there will be more changes along the way. 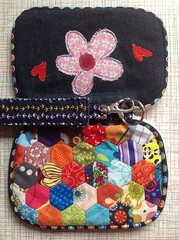 I will definately be adding some solid colour fabrics, to help accentuate some of the patterns. 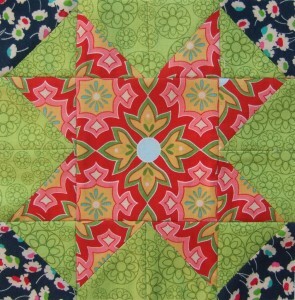 A lovely star block. You only need to make one, I want to make more, Instantly wished I had used a light blue backround, would the star pop even more? Waiting a fortnight for the next tutorial……that will not be easy! There is a Flickr Group for sharing your blocks. 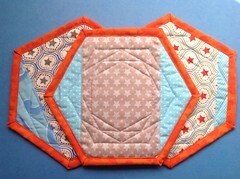 This entry was posted in Patchwork, Quilting Bee on March 16, 2013 by sophie newey. This entry was posted in Silent Sunday on March 3, 2013 by sophie newey. 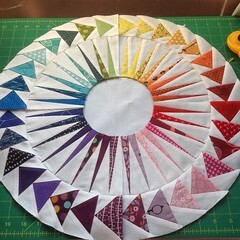 I started this QAL along a couple of weeks ago. 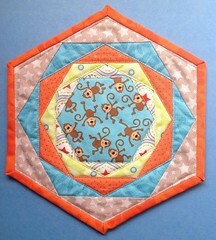 It is my first attempt at paper piecing of any kind, so do not judge too harshly! Half term and illness interupted the flow of things, but back to it yesterday. 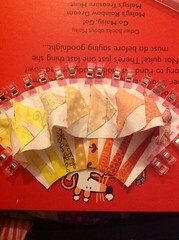 Leila sorted out my flappy corners and it seems obvious now, but it was a lightbulb moment for me! Yep the 1/4″ seam allowance is for the corners too, ta dah. 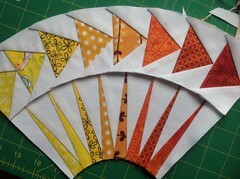 Armed with this info, piecing was much easier than my practice block. I love the way it came together. Most of the points and seams matched. A few hiccups and a little unpicking but nothing too stressful. 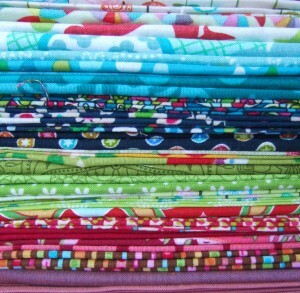 The fabric, I purchased from Justine of Simply Solids. At the end of December she had a sale. 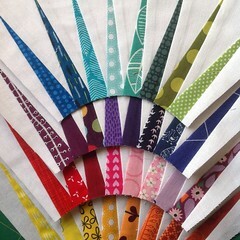 Everything was so reasonably priced, I thought I would try some different fabrics and colourways. I have used ; Mama Said Sew Moda Charm Pack, Kaffee Fassett Shot Cottons Coal and Vermillion, Kona Cotton Solids Ash and Charcoal all from Simply Solids. I then added some Architextures, text on white and Madrona Road, Memoir in white. 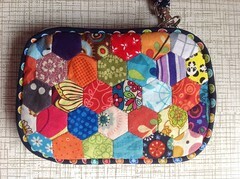 It must have turned out ok, because Hubby has bagsied it for a cushion in his office. It was really satisfying to make. You need a bit of patience and to be feeling as fresh as a daisy. Not something to pick up after a long day when you are tired. 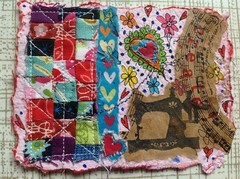 Well with that finished I am off to do some fast and carefree sewing. I have another Trip around the world to finish! 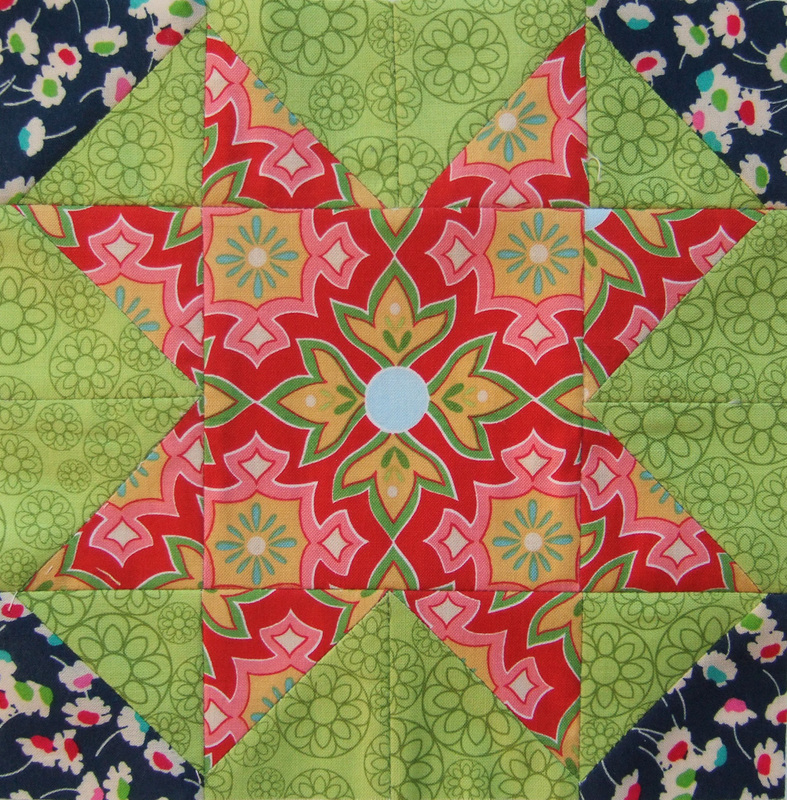 This entry was posted in Patchwork on February 26, 2013 by sophie newey. This entry was posted in Silent Sunday on February 17, 2013 by sophie newey. The rainforest Biome has to be our favourite. The verdant, steamy atmospere, so different to the Mendips. It was much cooler in there, than our last visit and we were able to amble through the jungle. So many things to see; bananas and papayas up high, rubber trees, cocoa beans, mangrove swamps and a malaysian hut. We stopped to watch a lady, making a piece of traditional batik fabric, then onto the enormous waterfall. Cascading through the South American Rainforest, with a cool breeze and light misty, spray. On the way down we stopped to admire the colourful sugar truck and the spice boat, with it’s many drawers. Finally at the end of the visit, Eden’s education centre ‘The Core’. A plethora of interactive displays. We headed striaght for the giant nutcracker. With it’s enormous windy handle. Then the seed made from Cornish granite, much taller than any of us and with it’s own peculiar sound. Finally we waved Eden a weary, cheery goodbye….until next time! Thanks to No.1 son, for permission to use some of his many hundreds of excellent photos he took of the day. This entry was posted in Holidays on February 16, 2013 by sophie newey. We have just returned from a fun packed trip to Cornwall. A whistle-stop tour. Our house is a bubbling cauldron of fresh ideas and excited whispers. It was mostly grey and wet, but that did not matter an iota. Lostwithiel did not disappoint. Kiddywink bought some space stamps. This prompted mesmerising postmaster tales, of planets; one made from diamonds and another surrounded by ice. A beautiful place, a suprise round every corner. The jolt of the familar, school chairs, old cotton reels not seen for aeons. Back at Owl Cottage the chance to catch up on my EPP Ferris Wheel, whilst planning Tuesdays trip. This entry was posted in Silent Sunday on February 10, 2013 by sophie newey.